If you live in central Indiana and you’re all about cheese — and come on, who isn’t? – you’re probably already familiar with Tulip Tree Creamery, owned and operated by local dairy king Fons Smits. You can find Fons’ fresh mozzarella, funky Foxglove, herby Nettle, creamy fromage frais, dreamy cultured butter and more at Indy-area farmers markets, on restaurant menus and at select gourmet retail outlets all over town. What you may not know is that Fons and company are generously sharing their knowledge through cheesemaking classes held here in Indy at the Tulip Tree production facility. I attended one of these sessions last winter, and was thrilled with the whole experience. Class sizes are kept small — around 12 to 15 — to allow everyone a chance to participate. Here’s how it all went down. Upon arrival, we were greeted with a festive array of Tulip Tree cheeses and accompaniments like crackers, cherry bomb peppers, baguette slices, dates, nuts and other yummy goodies. Besides TT’s greatest hits, we got the chance to sample the new Tiger Lily tomme offering, an earthy soft cheese with a gorgeous salmon-pink rind. So, so happy to dig in and meet my fellow students while noshing on all the cheese we could eat. For me, the whole spread easily stood in for dinner. If you were to order a much smaller cheese platter/plate of this caliber at a local mid-to-upscale restaurant, you’d be shelling out at least $15 or $20 easily. After filling up, we took our seats to learn about the art and science of cheesemaking. Fons himself greeted us, and then we received a short primer before donning our aprons and hairnets to give it a shot ourselves. Cheesemaking is not easy. There’s so much nuance and mad science in the whole process — making sure you achieve the right temperatures, stirring fast or slow enough, monitoring the curds, and a whole bunch of other technical steps along the way. Thank goodness our two small groups had excellent coaching, and working as teams, we were able to turn out a tasty queso blanco and stretchy balls of fresh mozzarella. 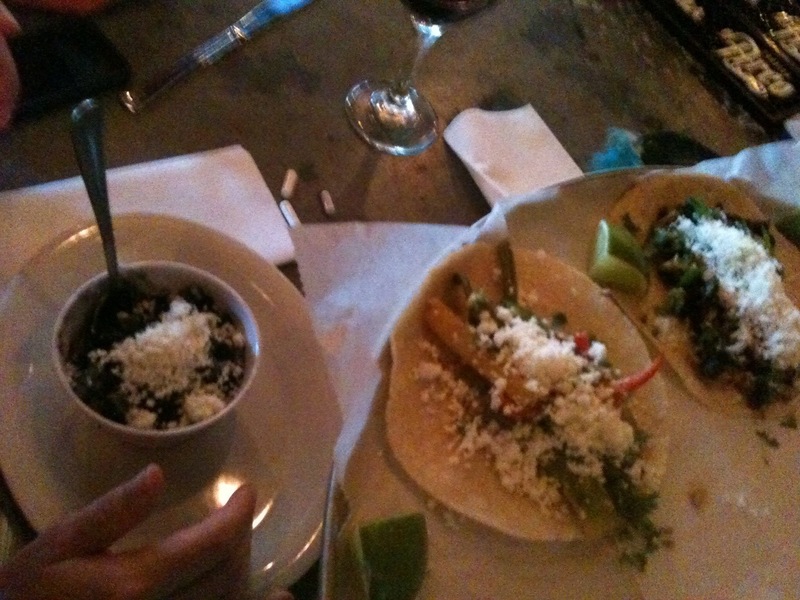 And, everyone got generous samples of both to take home – bonus!!! More than I could eat within a few days, I had to give some away to the neighbors. A few notes to keep in mind. Classes are BYOB; I brought along a nice Malbec and found my fellow students happily willing to share pours from their bottles as well. The price to attend is $50. At first blush, this may sound a little steep, but when you factor in the amount and quality of cheese you receive and the awesome hands-on experience, it’s well worth the price tag. Also, classes fill up quickly. If you want to attend one, check the web site and sign up as early as you can. All in all, a super fun — and tasty — way to spend a few hours. I couldn’t help but think this would make a great teambuilding activity, or even an interesting, educational thing to do with kids. I’m excited to see a parent-and-child mozzarella making class on the schedule roster for later in August. My kiddo would LOVE this. Amy’s Food Flights is now Breakfast, Lynch & Dinner! I’m back, with a new name!!! Let’s get this party re-started…. Made my weekly pilgrimage to the Broad Ripple Farmers Market yesterday, and here’s what we ate… a soft pretzel with cheese for dipping washed down with a lemon shake-up has become the kiddo’s standard summer Saturday morning breakfast. Yesterday, we had a buddy along for the ride. After their breakfast of champions, I was able to shop long enough to purchase a few gorgeous heirloom tomatoes and a slab of Tulip Tree Creamery fresh mozzarella to fix myself a Caprese salad at home. Just look at these beauties… Can’t say enough good things about the Broad Ripple Farmers Market. Always friendly vendors, great products, tons of cute dogs, and we usually run into people we know. See you there next week!!! Indy’s twice-yearly Devour Downtown promotion always provides a great reason to test drive new local eateries, or pay overdue visits to old favorites at reduced prices. For two weeks or so, you can score $30 prix-fixe menus at a couple dozen of the best restaurants in town. 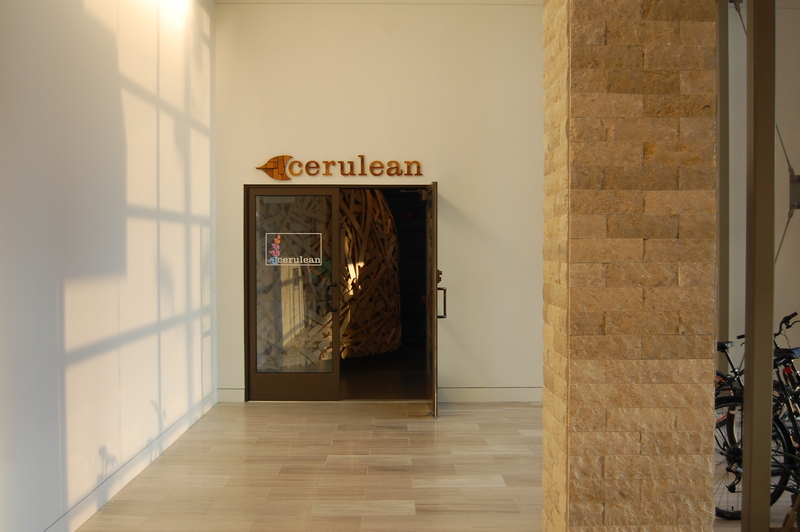 Last night, I grabbed some gal pals and we ventured down from the north side to check out Cerulean. This place has been on my hit list for some time now, and I was eager to get a peek at the Alexander Hotel that houses it. The hotel itself is sleek and gorgeous. The lobby feels very European (Scandinavian, perhaps?) with modern furniture and lots of clean lines. If we’d had more time, I would have loved to wander for an hour or two and take in all the art, which starts in the parking garage and carries through the common spaces, conference rooms and guest rooms. Pretty neat stuff. If you go, make sure to take a gander at the flying birds installation created from vinyl record cut-outs. 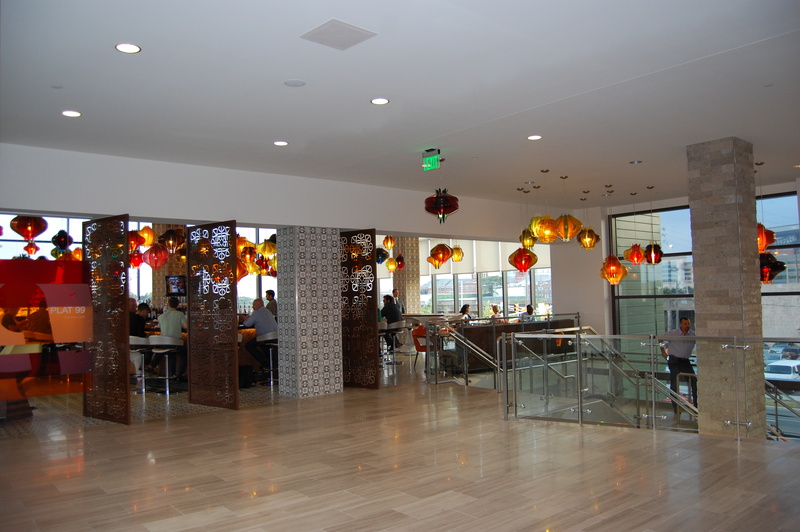 And the colorful glass lantern lights that hang throughout the Plat 99 bar on the 2nd level are nothing short of magical. Our first hiccup was finding the restaurant. The entrance is on the first floor of the hotel. We’d parked on the second floor of the garage, then taken the pedestrian bridge over. We came across Plat 99 first and wondered at first glance if that was it? Nope. It’s not. The guy manning the desk in the hotel lobby (also on the second floor) must have thought we were asking how to get to the restroom, not restaurant, and directed us to the facilities in a quiet corner. Uh uh. Don’t think so. Third time’s the charm, right? We finally managed to take the elevator down a floor and find the rather unassuming Cerulean door in the corner. 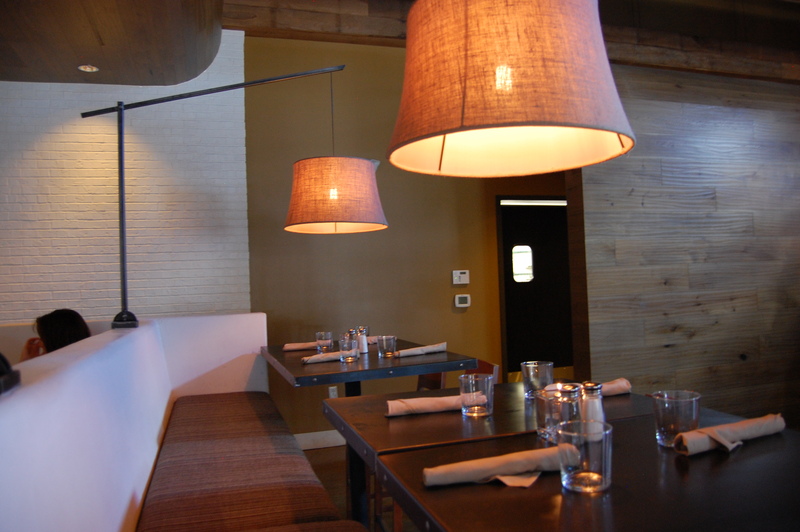 Once inside, there’s no mistaking that you’ve definitely arrived at one of the trendiest eateries in town. In keeping with the hotel’s artsy vibe, Cerulean boasts retro-mod light fixtures, tiny bowls of succulent plants on the tables instead of flowers, dark wood and creamy leather seating. The real conversation piece is… what to call this thing?… an igloo structure near the entrance composed of pieces of lumber. If you can imagine, it’s like a giant beaver dam. And if such a thing can be considered trendy, this is. You can even sit at one of a handful of tables inside it. Strange. Yet intriguing. The girls and I occupied a more standard banquette out of the main fray. The wine list here is pretty extensive (in addition to cocktails and craft beer) and required a little time to consider. In the end, I took our server’s suggestion for a sparkling rose, served in a pretty stemless flute. My friends seemed satisfied with their chardonnay and zin. Foodwise, I’d perused the Devour Downtown menu online and figured that’s what I’d order from, but the regular menu was tempting as well. It’s small enough to be manageable, conveniently divvied into a page each of small, medium and large plates. I’ve heard good things about Cerulean’s bento box-style lunches (note to self, must return to try.) I believe the menu changes seasonally, if not more often, and chef Caleb France gives a nice shout out to all his local food producers and suppliers on the last page of the menu. Although the buffalo chicken skins, chilled corn soup and duck breast with lemon fettuccini all sounded mighty good, I stuck to my original plan and went with the Devour menu. Two of my friends had the same idea, but one ventured out on her own to try the striped bass instead. The first course on the Devour menu offered a choice of soup or salad. 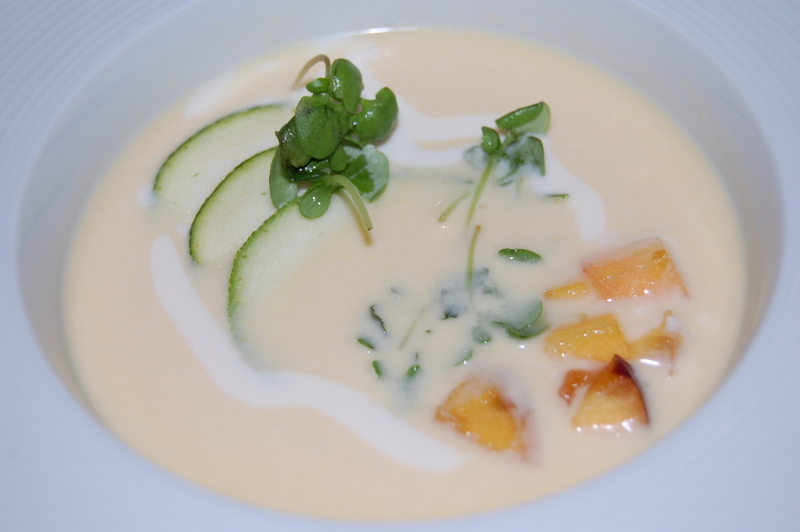 The chilled peach soup was much more savory than I’d expected, topped with a little garnish of diced fruit, several thin slices of cucumber and a drizzle of cream. I loved this. 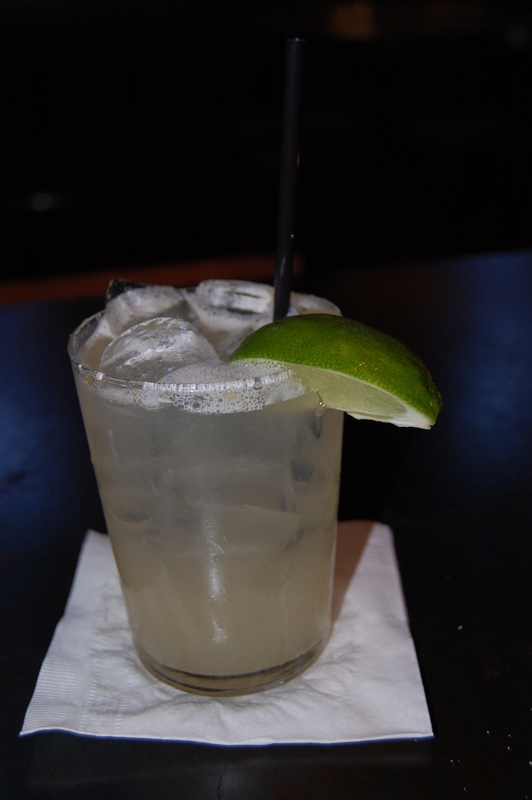 A refreshing starter for a hot summer night, and really delicious. 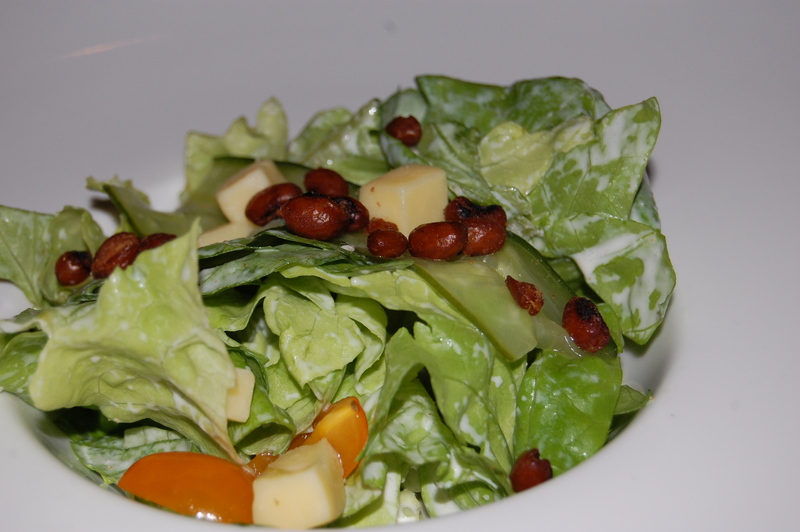 The salad looked good, too, a fresh mound of Bibb lettuce topped with black-eyed peas, tomato and a light buttermilk dressing. The three of us who ordered the Devour offerings all got the same entrée — a flavorful mélange of summer veggies over risotto with a smear each of dandelion and blueberry purees. This, too, was an excellent summer dish. The veggies were nicely cooked, and the risotto was creamy without being heavy. On paper, it didn’t sound like blueberries should work with this, but they did, adding just a touch of sweetness. (The other second course option was a chicken thigh over the same risotto and purees). 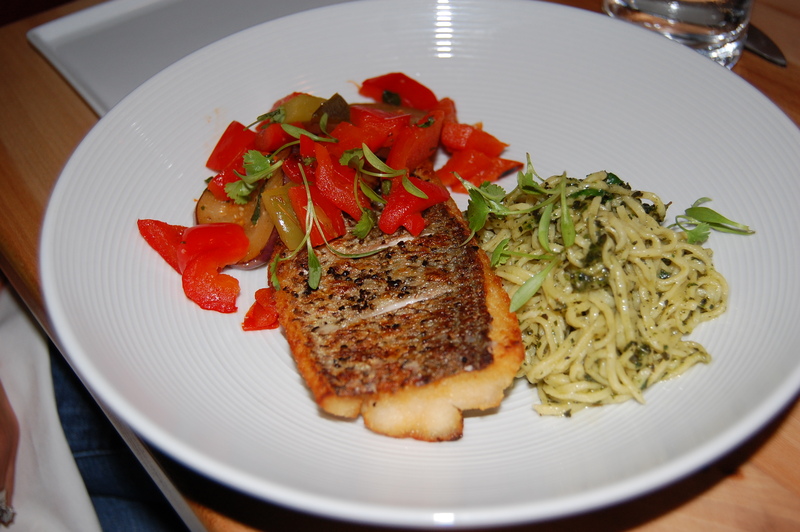 My renegade friend loved her fish dish, especially the small tangle of lemon verbena pesto-dressed linguine that came with it. Last up, the Devour desserts were a choice of chocolate bourbon cream or cherry clafoutis. Tough call. 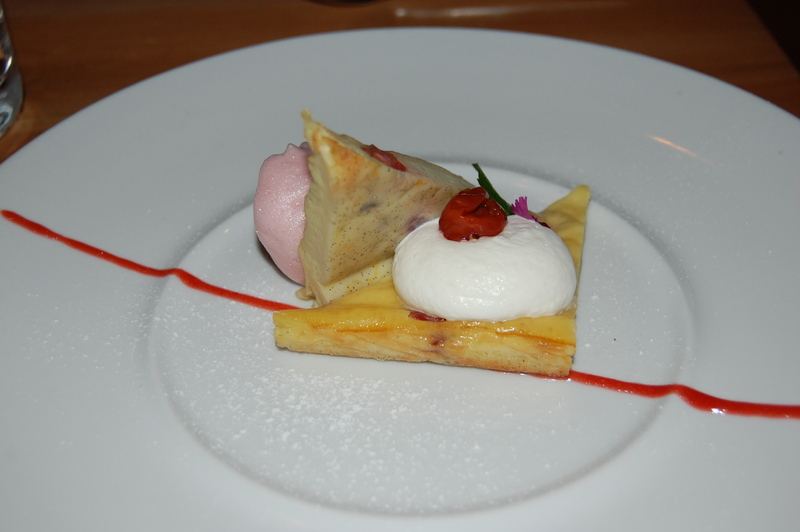 You all know how I feel about bourbon, but I was very curious about the whipped cherry beer on the clafoutis as well. Bourbon won out in the end. 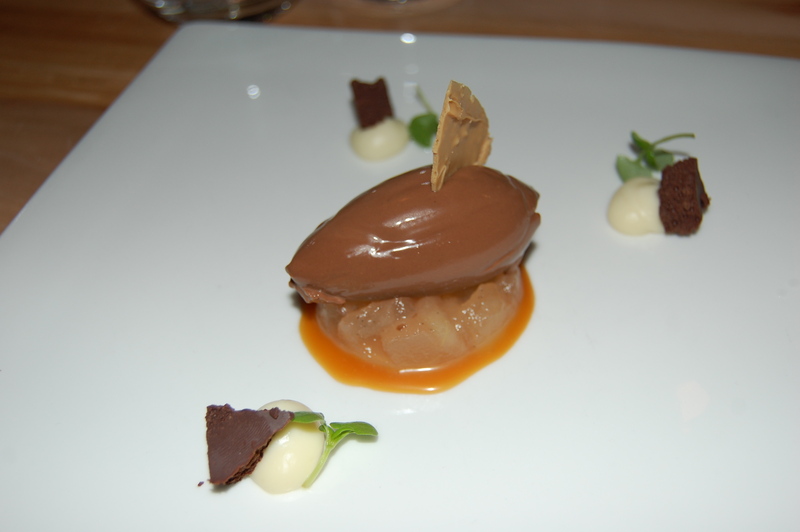 This plate had a lot going on — a luscious quenelle of chocolate bourbon mousse/pudding/ice cream sitting atop a small spoonful of yuzu-poached pears and spiked with a tiny wafer cookie containing, of all things, Pop Rocks. (!) Three tiny dollops of Brie studded with chocolate brioche croutons surrounded the cream (and were basically unnecessary, I thought). The cream was rich and yummy, but I couldn’t really taste any bourbon in it. Overall, good, but won’t go down as one of the best desserts I’ve ever eaten. My friend who ordered the clafoutis generously let me have a little taste. The cherry cake was beautiful to look at and very moist. The whipped cherry beer foam was interesting, but I’m still trying to decide if I liked it. Serving sizes throughout the meal were pretty much spot-on. We all cleaned our plates and left feeling full, but not stuffed. 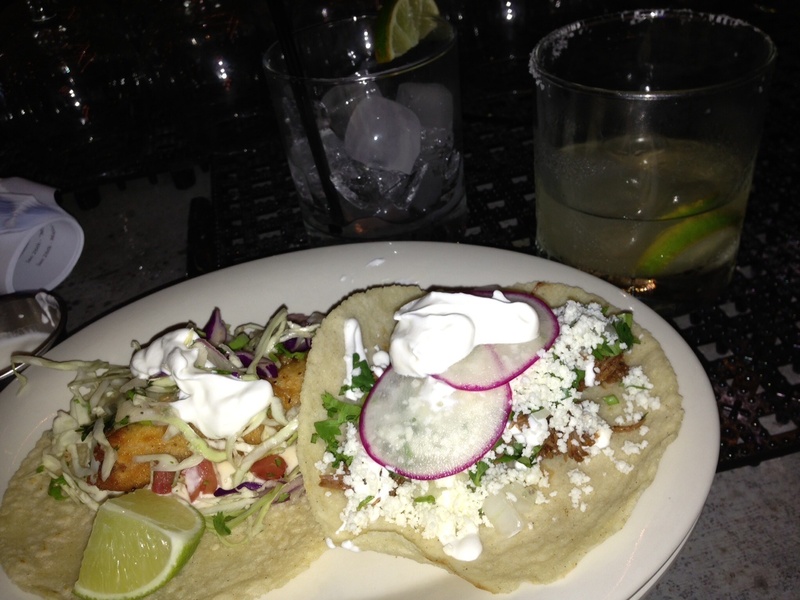 Without the Devour deal, prices can get up there when you tack on a drink or two. We all agreed that we liked the food, but our service left something to be desired. Our waiter was enthusiastic, fun and friendly, but we waited an awfully long time to place our orders, and he dropped the ball when one of my gals ordered a cup of coffee to go with her dessert. Plus, my bill had a major discrepancy — it included an extra $35 charge for an entire bottle of wine I never had. Our guy was apologetic, of course, and fixed the error, but I think we all felt that a little more focused attention would have made a big difference in our overall experience. On the upside, our water glasses never ran low. Cerulean was cool, maybe a little too trendy for my tastes, but I’m glad I finally got here. Will come back again to sample one of those bento-box lunches, or to have a drink at Plat 99. Dinner last night at Delicia with a lovely friend. After hearing great things about this place for months now, my expectations were high from the get-go. Maybe a little too high. After our meal, I find myself scratching my head and trying to figure out if I really liked it. I didn’t not like it. It wasn’t a bad experience in any aspect. It just didn’t blow me away to the degree of, say, Seviche a couple months ago. It would be quite easy to miss Delicia entirely were it not for one small sign in front of the otherwise nondescript SoBro building it calls home. (This structure used to be a video store in its most recent former life.) 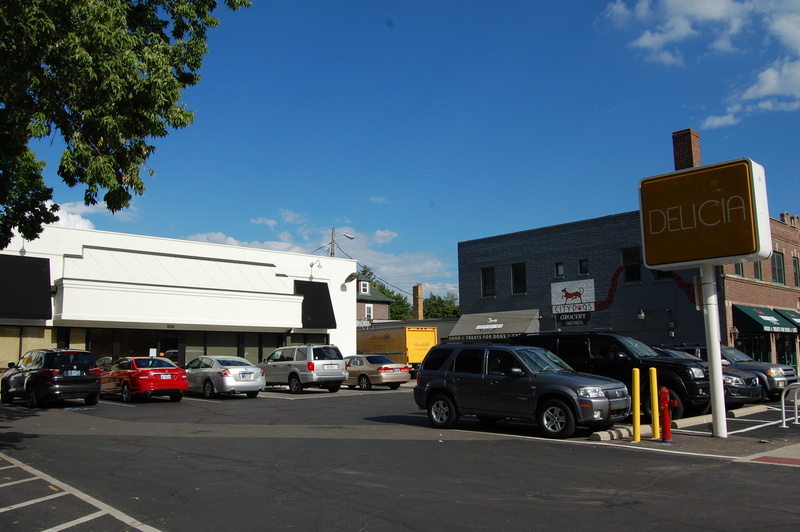 There’s a tight little parking lot in front of the restaurant, but you’re probably better off to skip it and scope out a space on College Avenue instead. 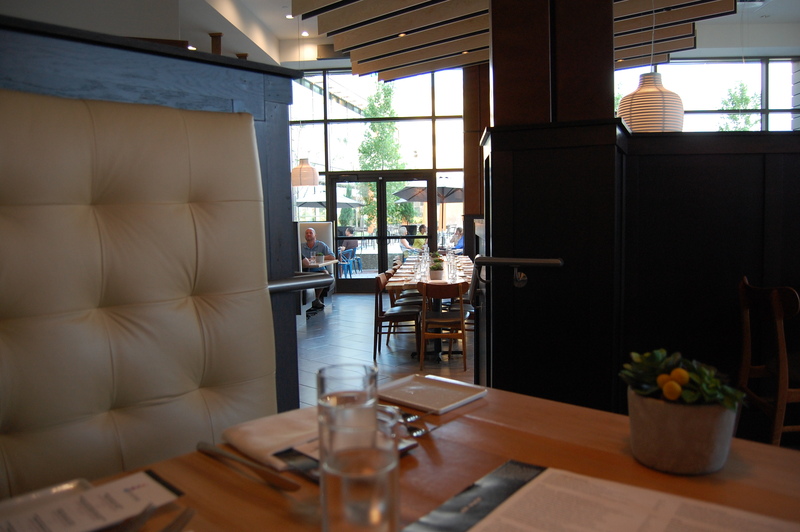 Once you get inside, though, the sleek and chic decor totally belies the ho-hum exterior with a massive mirror-backed bar, retro hanging light fixtures, a long white banquette running the length of the restaurant, airy beamed ceilings and subdued colors. 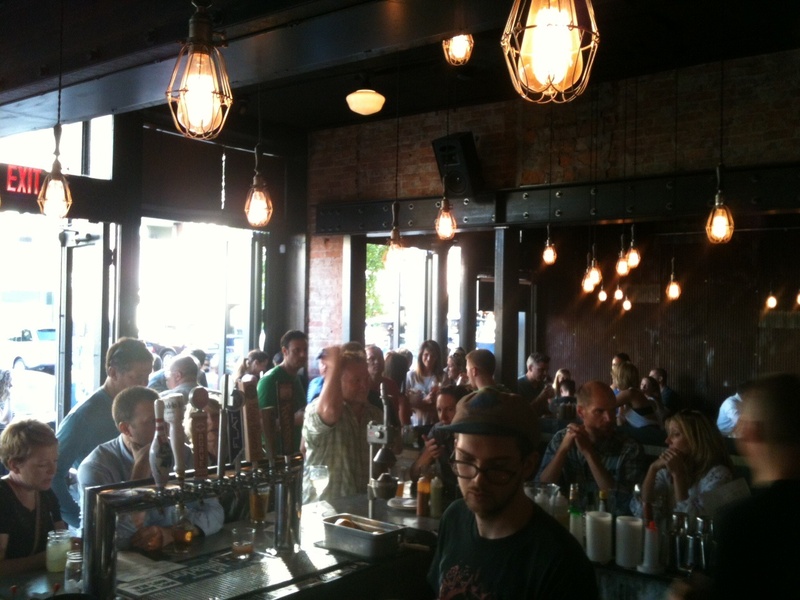 The place was pretty hopping for a Sunday night with a diverse range of diners in attendance. No kids though. I’d have to check to confirm, but pretty sure Delicia is 21 and up only. And even if it isn’t, this is not the kind of place you want to bring the little guys. So we ordered drinks and then turned our attention to the menu. I’d never had a caipirinha, and figured I’d try one for something new. (How fun is caipirinha to say, by the way? Go ahead. Try it a few times.) 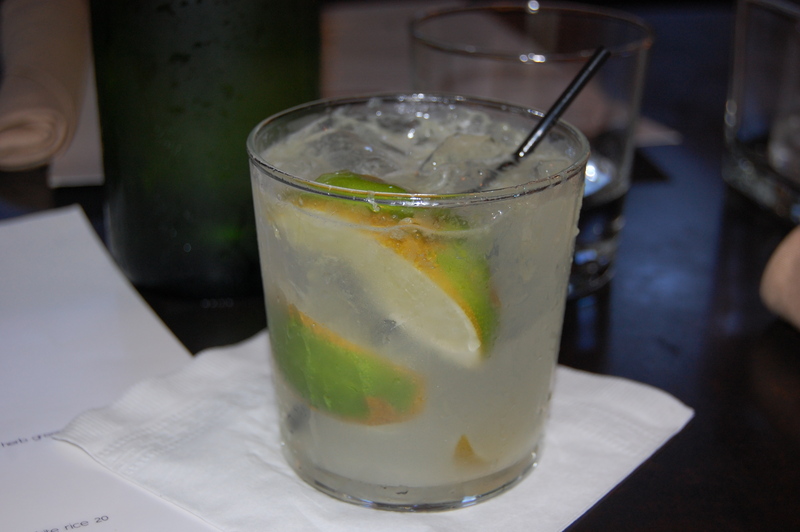 Caipirinhas are traditionally made with sugar cane liqueur, lime and sugar. This would lead one to believe it would be sweet, but not here. To be fair, our server warned me that the Delicia version wasn’t at all sweet, but is instead more light and refreshing. Since it was damn near 90 degrees outside, this was ok by me. And the cocktail was perfectly refreshing for a sultry summer night, but for some reason, it was a little too gin and tonic-ish for my taste (although it doesn’t contain any gin). I’m not a gin fan — see previous posts extolling my love for bourbon. Still, I drank it and it was fine. My friend enjoyed a glass of sangria. Again, the server accurately described it as being very wine-forward. Fruity? Not so much. Later in the meal, I switched to a mojito. 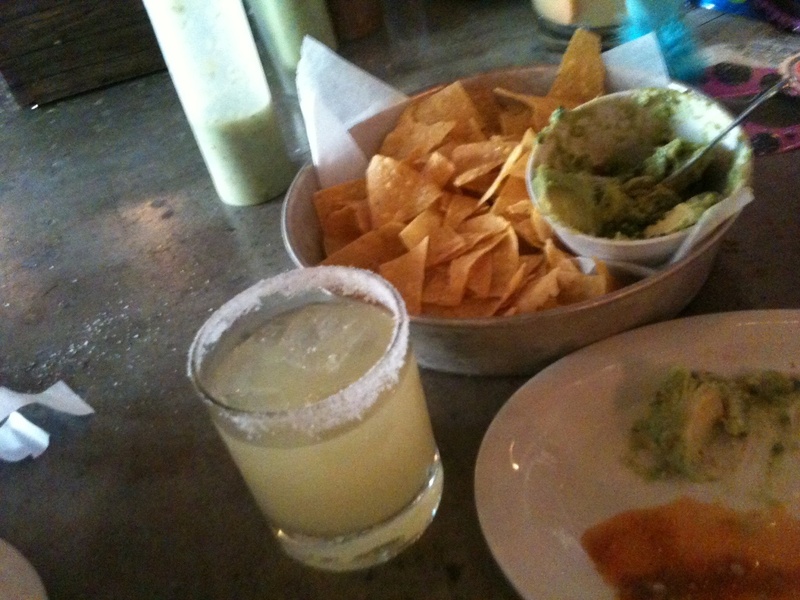 Also refreshing and tasty (and served in a big wide-mouthed water glass – yikes! ), but I was a little bummed that the bar here uses a mint syrup as opposed to fresh muddled mint leaves, which look so pretty in the glass. The spearmint flavor came through loud and clear, but halfway through, it suddenly got a little too cloying for me to finish. 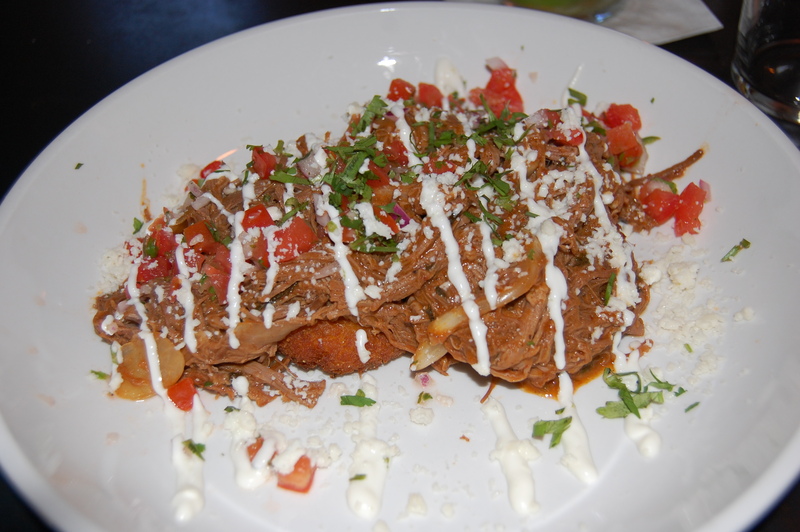 While not terribly extensive, the Delicia menu offers plenty of intriguing dishes. This is not your run-of-the-mill Mexican restaurant. If you’re looking for basic crunchy tacos and burritos, keep on driving. 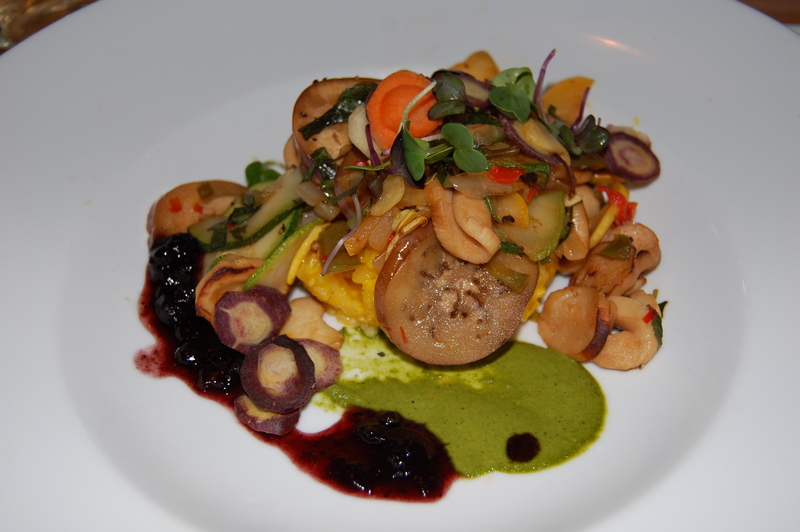 Delicia is upscale new-wave Latin cuisine. 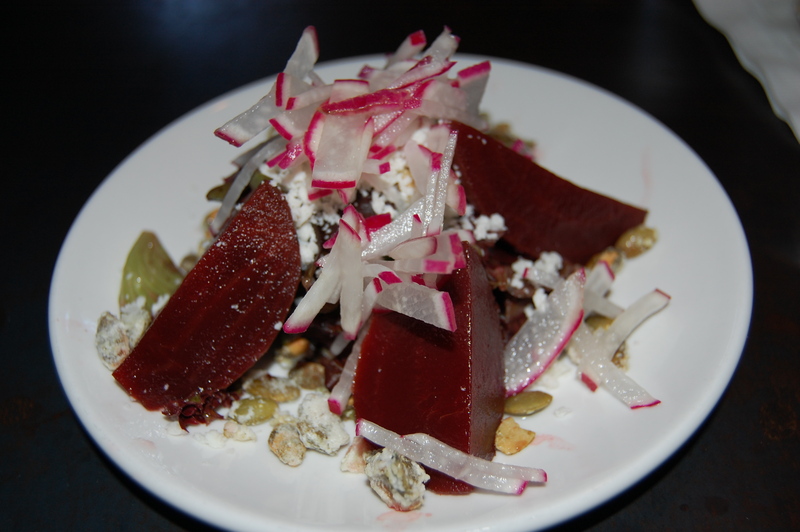 After debating appetizers for a short while, we agreed to share a spicy beet salad to get things underway. The kitchen thoughtfully split the serving for us, giving us each a beautifully arranged mini-plate version. This might have been my favorite part of the meal. Spicy was an understatement, so much so that it caught me off guard at first bite. These beets will kick you in the throat if you’re not ready, thanks to a bold jalapeno/sour orange mash-up. Elsewhere on the plate were a little mound of salad greens, pretty julienned red radish, crumbles of queso fresco and sweet-salty candied pumpkin seeds. A tasty blend of flavors, and the initial rush of heat quickly smoothes out into something sophisticated and delicious. Our server had promised us each a little amuse bouche or something of broth redolent with the Latin flavors to follow, but somehow, this item was forgotten until my friend thought to ask for it halfway through our salads. Delivered in a little sake-style cup, I’m having a hard time pinpointing just what this was, apart from an earthy broth with a umami-mushroom flavor. Not quite sure what the point of it was, but it didn’t hurt anything. I considered several different entrees, namely the pork carnita tacos, the carne chimichurri, and the duck enchiladas I’ve heard several raves about. In the end, I selected the tamal corn cakes (partially because of our server’s strong recommendation), and my friend ordered something called tapou — trigger fish in a coconut milk stew with rice and sweet potatoes. Our eyes nearly popped when the entrées appeared; the portions here are ginormous. We easily could have split one and saved room for dessert. I thought the food was good, but not great. My plate arrived lukewarm and so heaped with shredded barbacoa beef that I could barely make out the two small, but thick corn cakes beneath. The whole thing was drizzled with a cilantro lime crema and topped with a light sprinkling of pico de gallo. The meat was tender, and there was a ton of it, but I felt a little misled. As it’s advertised, it seems like the cornbread-like corn cakes should be the star of the show here. To that end, I had to scrape off some of the beef just to get to them. And I wished there had been more crema and pico de gallo (then again, I tend toward a heavy hand when it comes to sauces and condiments). The plate was mostly meat, and could have used a little more seasoning. In fact, now that I think about it, I felt like everything I tasted needed a dash more salt to really make it sing. I think my friend liked the fish. I had a bite, and it tasted good, but the texture was strangely chewy. I was expecting it to be much lighter and flakier. 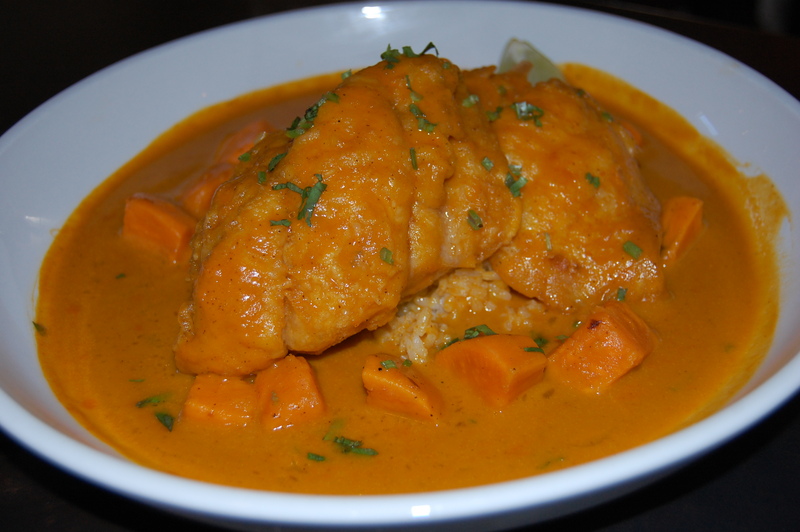 The coconut milk broth was yummy and the sweet potato chunks were well cooked. However, I couldn’t help thinking that this curry-style dish would have seemed much more at home in a Thai or Indian restaurant than a Latin eatery. We made as much of a dent in our dinners as we could, but still called it quits around the halfway point. The short list of Delicia desserts includes flan, tres leches cake, churros and a plantain bake with ice cream that sounded sorta like a cobbler. Alas, our stomachs had reached capacity and we had to pass. Props where props are due — to our server. While she wasn’t particularly warm or smiley, she did know the menu inside and out, capably answered our questions and offered intelligent comments about the food and drinks throughout our meal. While Delicia is a breath of fresh air on the Indianapolis dining scene and I’m glad I finally got there, I don’t think I’ll be rushing right back. I know several people who absolutely love, love, love this place, but for now, I’m firmly on the fence about it. Delicia doesn’t have a web site, but you can locate its Facebook page (including a complete menu) with a quick search.